Data is the most valuable asset of a company. It represent its past, its present and project it into the future. In the past, filing was based on piles and piles of documents. Consulting the information was a slow process, sometimes fruitless; losing a practice was common. This problem could also result in an incorrect decision or incomplete process. Today, with electronic filing, this problem has been partially solved. Companies have everything at hand and in relative safety, keeping pace with the employees. However, the amount of knowledge has increased at a dizzying pace, so many companies use a DMS and in the name of Smart Working encourage the use of cloud computing systems, such as Google Drive and Dropbox to manage files online. Do you know the history of Dropbox? When it made its entrance on the market back in 2008, it was founded by Drew Houston, a young computer programmer enrolled at Boston MIT. At his college there was a computer network, “Athena”, which allowed students to store and access their files from any place inside the campus. Houston thought to extend this benefit to all the world, sensing in advance a need common to millions of people to store and retrieve their files at any corner of the globe and from any device. Here, in this article I want to suggest you how to use Dropbox for companies. This magic box is going to be your ace in the hole at critical moments, as your documents follow you everywhere and improve your time management. 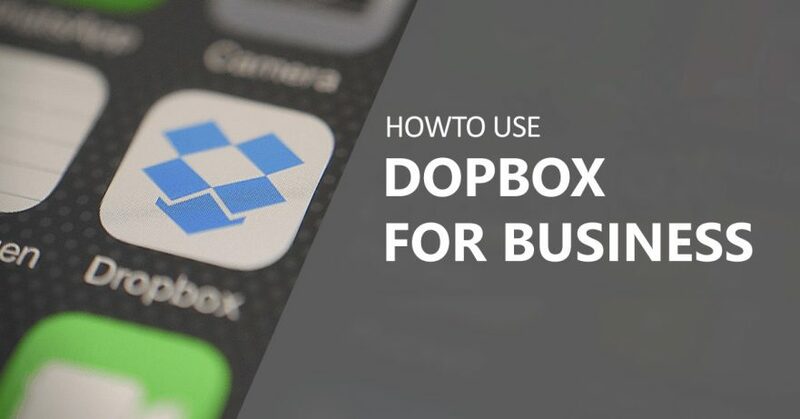 Use Dropbox for business? What is it? Dropbox is a storage service, for consultating and sharing files online. It easily integrates with your suite of office applications and graphics programs. It has over 300 million members and it is a real portable hard drive in which to load, exchange, and synchronize almost any type of content. Furthermore, you can do it in absolute comfort from your PC, smartphone, and tablet without taking up the physical memory of your computer. You get 2GB of space free, which can increase by up to 16GB each time you convince a friend to join Dropbox. If you’re interested in other solutions, instead, you will need to pay. But what does Dropbox cost? There are paid versions of Dropbox. I’m talking Dropbox Pro and Dropbox for Business, which have additional features and specifications. Dropbox for Business is the ideal solution to ensure a smooth workflow for working in large teams. Support is always reachable and storage is unlimited. The price is 12 euros per month per user. Dropbox Pro is 9.99 euros per month and offers 1 TB (1000 GB) of space. It allows for remote cleaning and more ways for sharing. Using Dropbox at work, in the office or from home is not difficult. The “magic box” has an intuitive design that keeps you satisfied with your user experience with this software, because it will be the one to suggest how to get around within it. To subscribe to Dropbox, just go on their website and click on the “Register” button. In the next step, create an account with your first name, last name and e-mail address and choose a password. On this point, be careful and think of a secure password. Your business can’t risk a leak; the loss could be enormous. To upload documents to Dropbox you’ll need to drag them into this folder, or copy and paste. You can rename the files, delete them, or organize them into subfolders. The client, always active, will save each modification in the cloud. In this way, regardless of the device with which you’ll be connecting, your work will always be up to date and synchronized. You can even use Dropbox offline; the changes are recorded once you connect to the internet. You can share an entire folder. Just right click on the tab and choose “Share this folder.” Enter the email address of your colleague who will then be able to view the information or modify it. This function has been improved in Dropbox for Business: In addition to the “Share link” option, you can choose to set a password with an expiration date. In this way, the company ensures secure access to documents, and blocks the file at the end of a project. In your system tray you will see a notification that will notify you of the link you just created and copied to your clipboard. To make the text string live and share it with collaborators, you can simply paste it into the body of an email. Dropbox for Business has two other very interesting options. You can use them to your advantage: The first is the full-text search. With this alternative you can search the file directly in the program without opening the folders. The second, Project Harmony, allows you to collaborate with multiple people on the same document, be it Word, Excel or PowerPoint. If you’re an Android user, you’ll have the ability to see a preview of the document without waiting for it to download. There are about 150,000 companies that use Dropbox to work with agility, in complete safety and with greater control over shared content. A powerful example is that of Kayak, the travel web site co-founded by Expedia, Travelocity and Orbitz. This space provides the opportunity to compare and choose in a single place, hotel services, car rentals and flights. Google Drive vs Dropbox: who wins the challenge? Making a comparison between the two cloud computing services is almost impossible. The reason is easy to understand: It has to be left up to you to choose the one that is most suited to your needs. However, a comparison on different “playing fields” will help you to better choose. Dropbox is compatible with various operating systems, such as Linux and apps for Windows Phone, and BlackBerry. Google Drive works perfectly, but only on Android and IOS. I’ll tell you more: the Big G mobile app allows you to edit Office files. The blue box, however, is accompanied by many third-party apps that take advantage of Dropbox to store and share information and configurations. For a user-friendly interface, the victory goes to Google Drive: the operations of the application are very similar to those that are done routinely from the desktop. For example, selection, drag and drop, double click. You know them well, right? Dropbox also has good usability but does not offer the same amount of features that its rival does. Without a doubt, Dropbox is a secure and stable backup system, but based on my experience, I still prefer Google Drive, a real online office, integrated with Gmail, Calendar and Docs. This is a guide to using Dropbox for business, a way to share your documents with ease, safety and speed. What do you think? Have you ever used this cloud system, or does your office use Google Drive? I look forward to your opinion in the comments. Did you enjoy this article? Help us to share it! Journalist, blogger and web writer. Author of SEOchef and HostingVirtuale blog. "I can't start my day without a cup of coffee and a long walk in the nature".